Thursday September 16th. Be part of it. 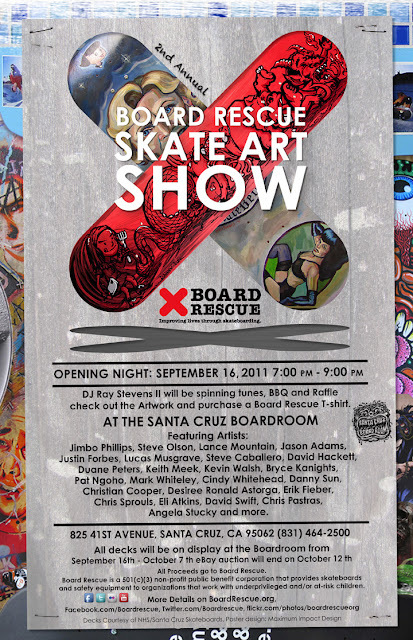 ﻿The 2nd Annual Board Rescue Skate Art Show and Fundraiser starts tomorrow Thursday evening September 16th and takes place from 7-9pm at the Santa Cruz Boardroom located at 825 41st Avenue, in Santa Cruz, CA. Lots of skaters are participating by donating brand new artwork originally printed on decks. The roster of skaters including: Steve Olson, Lance Mountain, Jason Adams, Steve Caballero, Justin Forbes, Duane Peters, Jason Jessee, Lucas Musgrave, Todd Francis, David Hackett, Keith Meek, Kevin Walsh, Bryce Kanights, Mark Whiteley, Pat Ngoho, Cindy Whitehead, Desiree Ronald Astorga, Christian Cooper, Danny Sun, Erik Fieber, Chris Sprouls, Eli Atkins, David Swift, Chris Pastras, and Angela Stucky. DJ Ray Stevens II will be spinning tunes, check out the Artwork and purchase a Board Rescue T-shirt. Boards will be auctioned on Ebay all sales will go toward Board Rescue. In the window from September 16–October 7th, Ebay Auction will end October 12th. All Proceeds go to Board Rescue. Board Rescue is a 501(c)(3) non-profit public benefit corporation. 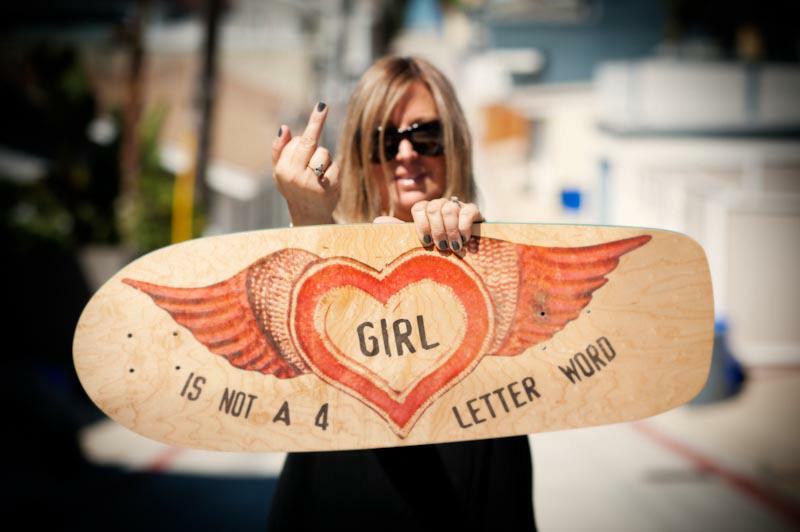 We partner with the skateboard industry to supply skateboard decks, trucks, wheels and safety equipment to organizations that work with children, targeting low-income and at risk youth. Our grants are made possible because of equipment donations from our generous partners, and monetary donations by individuals like you.